We skipped the walk around Port of Spain in favour of sitting in the bar having a drink or three and watching the people coming in for the special events. Lots of dressed up people attending dinners and dances. Then just went to bed – we were very tired. Up in the morning, packed, ate breakfast, then got a taxi to the airport. Flight to Barbados in a little tiny cute plane. That flight was fine – free seating so Joe and I grabbed the front as we had a quick change in Barbados. Turns out we had to go through immigration, then get our bags, then go check in again. Got to Barbados, got off the plane quickly, and saw the immigration queue which was miles long. I looked at the bloke pointing the way and said ‘but we have a connection to make in 2 hours!’ He then pointed to the empty lane marked ‘transfers 3 hours or less’ – hooray! Though the people in the long queue were muttering when we went straight to an officer. Then it was wait around for the bags, but someone was smiling at us because ours were off first. Then the mad dash through customs and the entire bloody airport to the Virgin check in desks. I’m amazed at the number of people who check in late – but then I’m usually stupidly early for airport check in! We had time to grab a quick bite to eat before just joining the queue to get on the plane – so not much time at all. The flight was pretty miserable and long but we are now home. Tired and doing laundry and off to work tomorrow. We had to leave Asa Wright so I am now blogging from the Hilton in Port of Spain. Scenery is not nearly as impressive. On the way to see turtles we saw several birds and even got a good look and photo of a hawk. Interesting drive to the beach. On the way back to the centre from the beach we got to see loads of frogs in the road. Large and small and even a bright green frog! So lots of birds, turtles and frogs. So slept in this morning, missed breakfast to sleep! Got up and got showered and packed and then to sit on the veranda for a last look over the rainforest. Our ride to Port of Spain was an hour late due to an accident on the road (the road is a little twisty mountain road, in many places just one car width wide) but as we didn’t have anything planned it wasn’t such a bad thing. We had a nice drive into Port of Spain but it is much hotter here than it was in the mountains. Joe is now on the terrace upstairs getting photos of the city. We’ll probably skip the whole walking around Port of Spain thing though. Birds, Turtles, and Frogs, oh my! Last day at Asa Wright and we are sitting on the veranda again watching the rain and birds. Last night was fun. After a restful afternoon, napping and taking it easy, we were collected and driven down to Matura. We parked and walked along the beach a bit while dinner was being set up. Ate then did another walk along the beach to see if we had really seen a turtle coming in. It was a turtle shaped log. We then sat in the shelter and waited for Nature Seekers to turn up. And turn up they did, in droves. A truck load of volunteers. After they were sorted into teams and sent out we were given a brief talk. Toward the end of this talk another tour group turned up – unfortunately we were stuck with them. Unfortunately because most of them had no idea why they were out on this tour! One young lad just kept whining “what is happening now? How long will this take? Are we going back yet?” while his girlfriend climbed all over him. But I hope they learned a bit about turtles. We headed back to the beach and our guide talked about what would be happening – in the middle of this a volunteer turned up next to Kathleen and handed her a baby leatherback turtle that had just hatched. There were hatchlings all over the beach. We then walked for quite a while and got very wet climbing over palm tree trunks until we got to a female that was digging and preparing to lay her eggs. (This is where whiny bloke started up.) We watched her dig, then when she started laying the volunteers moved in to tag her, then the tourists could start taking photos. Up the beach a bit further was another female and you could tell when she started laying by all the flashes around! Once she started filling in the hole all the lights were turned off and we watched her finish and move off into the surf. On the hike back we saw three more coming in, but didn’t stop to watch them. So back to the centre very late (gone midnight) and wet and sandy but very happy! Did I mention we are in a rain forest? During rainy season? The thing I didn’t put in the blog yesterday was that it rained. Poured yesterday. Thunder and heavy rain. We walked between rain storms. So I was expecting lots of rain still today. Instead we woke up to sunshine. A horde has descended. We did have there centre more or less to ourselves. Another couple turned up last night and it was just us. We’ve been quietly sitting and chatting and generally birding; they also came to the oilbird cave with us. But when we got back the entire veranda was packed with a tour group that are here for a few days. I think we hit it just right though – we had the small group of about 9, then the place to ourselves and tomorrow morning we leave. 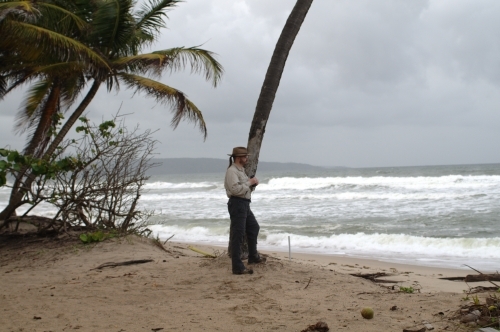 This afternoon we head out to see if any leatherback turtles come ashore at Matura beach. I’m looking forward to that! Frogs, lizards and turtles in one day! Today was a quiet day – just hung out at the centre. Up at our usual time (6am) and off to the veranda to see what was on the feeders and have a coffee before breakfast. Then back to the veranda for more wildlife pestering (Joe has been harassing them to get their photos). At 9 we joined the group that was here for a visit of the coffee processing room. The Centre grow the coffee that is served here – so grow, harvest, dry, roast, grind, and make. The processing room is a small room where they have a gas burner and a large pan that they roast the beans in. One person operation and interesting to get to see. We mainly hung out on the veranda today looking at things. We did take a short walk after lunch. We can hear the bellbirds all the time so we headed out to look for them along Bellbird trail. Found out later you can’t see bellbirds on that trail and we didn’t. We did see white bearded manakins and that was all. However, over the past few days we have seen: Carib grackle, purple honeycreeper, blue-crowned mot mot, channel billed toucan, palm tanager, white-tail trogon, scarlet ibis, egret (little, great, snowy), golden-olive woodpecker, barred & great antshrike, piratic flycatcher, golden-headed manakin, tropical mockingbird, thrush (? ), yellow oriole, blue-grey tanager, silver-beaked tanager, green honeycreeper, red-legged honeycreeper, violaceous euphonia, turquoise tanager, among others that I can’t remember. We have also seen lizards, toads, boas, caimans, agouti, among others that I can’t remember! Tomorrow we are off to the oilbird caves to see oilbirds. Maybe we’ll also go along the Discovery trail and see some bellbirds! Then tomorrow afternoon/night we’re off to see if we can spot a leatherback turtle come in to lay her eggs. Joe has been taking hummingbird photos all day. Poor hummingbirds. Though they do seem to be coming up and posing for him! Woke up to sound of the rain. It started around 2 or 3 this morning and was pouring it down all morning. Well, it is the rainy season and it is a rain forest. So we skipped the orientation tour again (I guess we can do it Friday morning before we leave), instead sitting on the veranda and watching the wildlife and day tourists come in. The rain slowed down so we headed out along a walk and got to see a toucan. Lovely. Joe got some good photos once he finally found the bird! We had lunch then got ready to head out to Caroni to see the scarlet ibis. There is a group here from the US and they had their swamp trip planned so the centre stuck us onto their trip. This worked out very well, though they headed off in two vans and Joe and I had our own van we all shared the same boat and had that to ourselves. So only 11 of us in the boat. On the way to the swamp we stopped at a water treatment plant and bird watched. There were Spectacled Caiman at the treatment centre and they were lovely. There were also a lot of birds and dragonflies. We then got to the swamp and got into our boat and headed out. Saw loads on the way out – crabs, two boas, and loads more birds. Once out we got to see several scarlet ibis. However, the best time to see the ibis is in December, January or February as they fly in in the thousands and roost in the trees. The worst time to see the ibis is in June when they have started nesting and don’t fly in their thousands and do not roost. Also it’s the start of the rainy season so you get wet. And there are zillions of mosquitoes. We were coated in deet but still had to fend off the beasts. But we had a good time and saw loads. I can’t begin to list the birds I’ve seen. The group we were with was lovely and a lot of fun. We even had our rum punches out on the boat. So a very fun day but tiring. Off to bed! And we are on holiday! Finally. Woke up after a restless night’s sleep – the rainforest is a noisy place and the birds wake up early. So we weren’t feeling 100% today. Skipped the orientation walk and will do that tomorrow. The plan for the day was to find out what trips we could do and sit on the veranda and watch things. So that’s what we did. We are now planned to see : on Tuesday the orientation walk and Caroni Swamp to see the scarlet ibis (hopefully even some spectacled caimans and boas); Wednesday more sitting on the veranda and possibly swimming in the pool (shall have to include a photo); Thursday oilbird caves in the morning and off to turtle watch in the evening. Friday we’re off to Port of Spain for the day (possibly just laying around the Hilton if the turtle watching goes on to the wee hours) then off home Saturday. Sitting on the veranda was actually much more interesting than it sounds. There are bird feeding stations and we saw loads of different types of birds, lizards, and even agouti! We are at the Asa Wright Centre which is lovely and Joe is uploading photos of birds and landscapes to his Panoramio site. So after our flight from Jamaica, which seemed fairly long but actually was only a series of short hops between islands. We arrived early 15 mins to be exact but the immigration line was long and slow, and as usual we picked the slowest. Once we got out we could not find our pick up but after some phoning he appeared, and so the hour long drive in to the mountains. Arriving at the center some time about 10:30. They had left us a flask of hot water and some tea and some sandwiches which the ants were trying to desperately get in to (I think some had managed). So we ate then got ready for bed which involved a quick spray down with anti-bug spray. then to sleep – well apart from the frogs bugs and birds partying all night. Last day in Jamaica and we’re off to Trinidad. Being collected at 10.30 and the flight is at 2pm. We’re flying off with many of the Caribbean delegates who were at the conference as we’re stopping on another couple of islands along the way to Trinidad. So I get to work for another few hours. Should be in Trinidad by 8.30 tonight. Yesterday was the main meeting of the organisation and that wen’t well. We managed to finish it up before lunch and so could do a nice tour of Kingston. Well, Devon House and the Bob Marley Museum. Didn’t get to do much at Devon House though a few people had ice cream (I was too full from lunch – the food has been fabulous) and then spent about 2 hours at the Bob Marley Museum. We were the last group through. It was interesting to see the museum again and nice to get to see a bit more of Kingston. We got back hotel after the time we were suppose to have been collected for dinner! So we were given more time to get ready and then out to Eden Place for dinner. We had a set up on an open veranda area complete with band. Lovely dinner but very loud, really could not chat to people. But then that’s Jamaica – if you can squeeze a sound system in and turn it up loud you do. It was a fun dinner with lots of dancing and drinking and eating. I was surprised when it ended before 11 but we had people flying out at ridiculously early times in the morning (taxi collection started at 4.45am!). Up this morning, breakfast, good-bye to the people who are staying a bit longer or flying out a bit later and we’re now packed and waiting to go. I had my plan for the day, to get some postcards and then maybe go out somewhere or failing that sit in the pool with a crate of beer. Just as I was leaving Kathleen ran across the lawn and told me they needed more photos as the photographer wasn’t around yet. So I ran up, grabbed my bag, and spent the day taking more pictures. As I was downloading the second day’s worth of pictures we were told that the bus tour around the campus was waiting for us. So we ran down and hopped onto that and I got a few more pictures of more parts of the campus. After that we retired to the bar for a few drinks and something to eat before the evening’s entertainment. We decided to try the Juicy Patties again, this time I had a meat stuffed loaf followed by grapenut ice cream. I have no idea what a grapenut is but it tasted good. We then went to the 50th anniversary University Singers’ Concert which was brilliant; moving its way through religious and gospel music to folk and popular at the end. It was a retrospective across the 50 years of performances. Back to the room for a beer and a quick blog update and bed.